I really liked reading If I Stay and actually felt bad that it took me so long to read it. The good thing in that is I don’t have to wait for the companion novel and I got to read it while the story is still fresh in my mind. WARNING: This review contains spoilers for If I Stay, even the summary for Where She Went has spoilers so avert your eyes if you haven’t read the first book. Trust me, you don’t want to see spoilers. Here’s the link to my If I Stay review instead. Now living on opposite coasts, Mia is Julliard’s rising star and Adam is LA tabloid fodder, thanks to his new rock star status and celebrity girlfriend. When Adam gets stuck in New York by himself, chance brings the couple together again, for one last night. As they explore the city that has become Mia’s home, Adam and Mia revisit the past and open their hearts to the future — and each other. Oh Adam. Did I enjoy reading Where She Went? Surprisingly yes, in spite of my reservations. I should have known to trust Gayle Forman because she’s an excellent storyteller. I enjoyed seeing everything through Adam’s eyes. It gave the initial story in If I Stay more depth, while adding in layers provided by the years when Adam and Mia were apart. Although I think it would have been better if we got more insight into Mia and what she was thinking. Don’t get me wrong – it did feel like everything fell into place quite nicely – but I kind of felt like there wasn’t enough of Mia in this installment. 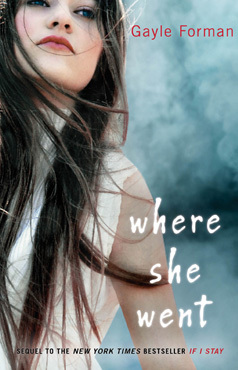 I really liked that Where She Went has New Adult characters because we really need more novels like this. Both If I Stay and Where She Went are contemporary novels that I highly recommend. I feel like I’ve been lucky in my contemporary reads in 2012, so far. *keeps fingers crossed that will continue for the rest of the year* I look forward to seeing what Gayle Forman has in store for us next – looks like Just One Day and Just One Year will be companion novels too. Excellent review! I’ve been avoiding reading this one for many of the same reasons you out it off. It has become increasingly more difficult because my local library keeps putting it up on the ‘hot new books’ display that I see Every Time I Walk In! Maybe I’ll cave and finally read it! michelle, no need to avoid reading this one! So many others have mentioned that they even liked this one more than If I Stay but I think I like them about the same. Hope you get to borrow a copy from the library soon. “it did feel like everything fell into place quite nicely”=> Good. 😀 That’s how I felt. I agree though about having a bit more from Mia’s side. I wonder if Gayle Forman could’ve made alternating perspectives work? I would miss Adam, though. 🙂 I’m definitely picking up the companion novels. Ack! I’m STILL hesitant about reading this one, even though I have a general idea of what’s coming I just keep thinking somewhere in the back of my head ‘if I don’t start Where She Went, Mia and Adam never screwed things up’. Lovely review though, I’m really glad that you did end up enjoying it even with your hesitations, I’m sure I will too! I just love it when an author blows away your expectations. Like you get nervous going in and then are like, jeez what WAS I worried about? I sort of felt the same going in. Love this. And Adam. AND NEW ADULT. And the character development. And good contemporary! Exactly! I was a bit nervous going in, I was worried that Gayle Forman wouldn’t be able to pull this off. But yep, really didn’t need to worry about anything. Yes to New Adult! We really need more books like this one. Would love to read more contemporary novels with characters in their late teens or early twenties. I really thought that this book added to If I Stay, even though I did think that If I Stay ended in a good place and wouldn’t have necessarily needed a companion book. I am looking forward to Forman’s next books too! Marg, looks like we felt the same way about If I Stay! I put off reading this one because I liked where If I Stay ended. Good thing I was pleasantly surprised by Where She Went. Yep, I’ll be on the lookout for Gayle Forman’s next novels. Although I’ll probably wait for both of them to be out before I read them. I loved Where She Went. I agree that If I Stay could have stood on it’s own and been fine but I loved seeing Adam’s POV in the whole thing. His anger felt very real to me and I felt angry at Mia too but in the end it made sense and I think it kind of allow them to well, you know what happens. Adam is pretty amazing, isn’t he? Even when he’s all emo and angry, everything still makes sense from his POV. I was angry with Mia as well because I couldn’t understand how she could be so mean. So glad things worked out in the end.